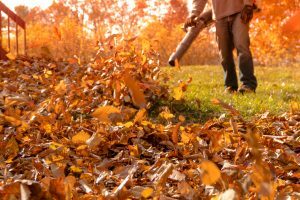 Fall in the Denver Area comes with a lot to love, and as we move farther into the season, it’s time for many of us to get serious about leaf clean up. Now that the trick-or-treaters have moved on, and most of the leaves have come down, fall clean up should take priority and not just for aesthetic reasons. Consider this your wake up call to finally get moving on cleaning up your yard. Nature is well suited to handle the influx of nutrients that come with naturally falling leaves and other organic material that falls during autumn. Problems occur, however, when these leaves encounter the built environment — like roofs, paved streets and sidewalks. Rather than decomposing back into the ground, debris gets swept off concrete and asphalt surfaces and down storm drains or blown into local waterways, creating an unnatural balance of nutrients in the water table. This can impact not only the organisms that live and depend on local streams and rivers, but the overall quality of the water that eventually makes it into our own taps and homes. Leaves especially impact water quality by contributing to an abnormally high buildup of phosphorus and nitrogen, which can trigger sometimes toxic algae blooms and other issues in the water ecosystem. This disruption in the chemical balance of water can even contribute to the growth of certain bacteria, like cyanobacteria, that can be harmful for human consumption. This puts a strain on local water municipalities struggling to filter out water problems, and address issues with local water quality. The good news is, you can help with your own neighborhood’s stormwater management. Keep your water, and your local water ecosystem, as fresh and clean as possible. The biggest impact you can make at home to help keep your water safe and high quality is to collect and properly dispose of leaves in and around your home and yard. Many cities offer leaf collection specifically for this purpose, so it’s worth a call or a visit to your city’s utility to find out when leaf pick up is scheduled for your area. Many other organizations, like the Boy Scouts or local elementary schools also collect leaves as part of fundraising efforts, so you can explore those options if you’ve missed a city-run leaf collection deadline. You can also feel good about doing your part to keep your water, and your local water ecosystem, as fresh and clean as possible. If you have additional concerns about your water quality, or if you’re worried about the amount of leaf litter in your area, you can always talk to your Culligan of Denver. We’re here to help you learn about options for filtering your water to ensure you have great tasting, clean water in your home, no matter the season.